Depressive and bleak as black metal gets, this one-man Australian band first caught my attention with several re-releases of early material, so it's good to finally catch up and hear a modern form of their sound. As you'd expect, it's more professional if no less atmospheric and compelling, that mysterious artwork suitably summing up the esoteric nature of the music. For a third full-length, this is excellent stuff, and mainman Mutatiis didn't make it easy for himself, Blood Geometry being a double-album with a full length of over two hours of music. That title suggests Deathspell Omega-esque levels of chin-stroking neo-occultist obscurism, and you'll find plenty of that here, although Elysian Blaze leans much closer to the ambient side of black metal. Opening with delicate piano on A Choir For Venus, obscured beneath a layer of slurred whispers and gothic ambience, the album soon crashes into life on the following The Temple Is Falling, chaotic and jarring cymbals atop a murky mixture of growls and deep riffing, altogether forming a near-orchestral sonic collage that is atmospherically gripping. The various stops and starts (including moments where the blastbeats take over starkly, with no backing wall of sound, and moments of simple ambient beauty) work well to make you forget that the track is over eighteen minutes long, and is not even the longest piece present at that! That sums the album up, really; certainly a weighty tome that will take much effort and dedication to really fathom. Fans of funeral doom and depressive black metal in general will find much to appreciate, however, from the satanic church organ that opens the twenty-three minute Sigils That Beckon Death before a wall of furious chaos descends, to the brief yet epic moments of melody that desperately grasp at you throughout the track before being sucked back into the bleak void. Almost catchy crunching riffage devolves into doomy clunks, like Godflesh turned rotten and putrid, before a slow crawl back up towards a kind of cold redemption as ethereal melodies and hypnotic post-Burzumic ambience strokes you with a skeletal carress. The relatively short (nine minutes) title track is something of an interlude afterwards, echoing growls beneath a delicate tapestry of soft melody. There seems little point in describing the ins and outs of the second CD, such as my limited reviewer skills can replicate the actual experience... Suffice it to say that the icily grandiose Pyramid Of The Cold Son especially works wonders on the hairs on your neck, what sounds almost like a lonely distant cello towards the mid-point of the twenty-two minute track quite incredible. The second CD as a whole leans slightly more towards the oddly beautiful, not always what you'd expect to hear, yet even as Mortiis rants and shrieks the music that he combines his vocal terrors with is perfectly judged. Perhaps it's that, then, which makes me hesitate so briefly before giving Blood Geometry the score and award that it carries - it damn well deserves both. 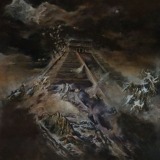 Music in such long, uncomprising slabs as this should not be so enjoyable in its wallowing misery, should not paint its atmospheric scenes so well, and should not be relegated to a sub-Xasthur status when the thirty-seven minute Blood Of Ancients, Blood of Hatred alone is better than anything that project has released of late. An excellent release in every way.